Hostiles has great acting, great cinematography, had a decent enough basic story, but unfortunately it layered on the dramatic violence too thick and as a result has an uneven story. While the production values were excellent and it is filmed on location from New Mexico to Montana, there were some glaring factual inconsistencies that also bothered me. Set in 1892, director writer Scott Cooper tries too hard to make his point about racism, violence and redemption. It had a bit of a film school Odyssey feel, with the next violent danger awaiting just a head on the trail. While I appreciate his John Ford influence, a lighter touch on the message would have made a more effective movie (something Ford certainly knew). It is too bad, because I really liked the cast and the film. It could have been so much better. Despite the film's flaws, Christian Bale, Wes Studi, Rosamund Pike and the rest of the cast are excellent. I just wish there was more Wes Studi to play off Christian Bale. By eliminating some of the over the top plot lines/scenes, there would have been more time to develop the core characters. 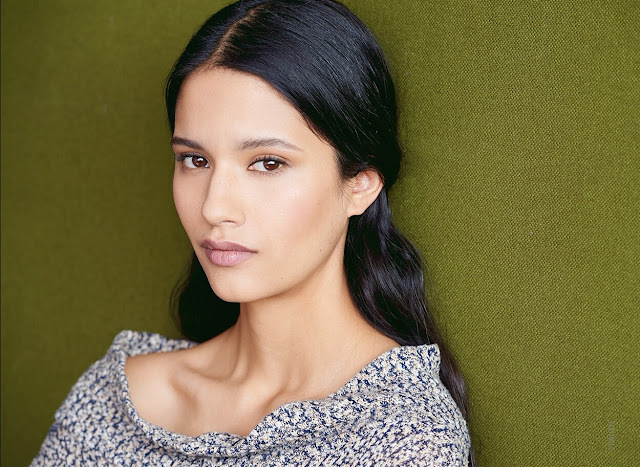 For example, Studi's Chief Yellow Hawk's family, played by Adam Beach, Tanaya Beatty and Q'orianka Kilcher were under utilized. That's a shame. Christian Bale as Capt. Joseph J. Blocker gives a heck of a performance. 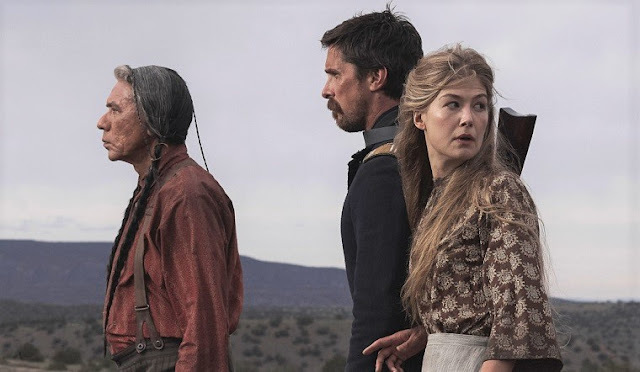 Bustle: Is Hostiles a true story? I should have known (and checked). Linked! 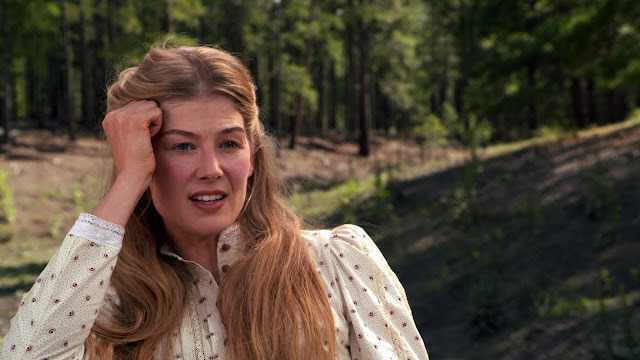 I've always had a serious thing for Rosamund Pike since she played Miranda Frost. PS Girlfriend needs to put on some serious weight. No worries! With the search function over at my blog I can't always find stuff even when I know it's there!